Even if the SX280 adds little new compared to its predecessor, it does succeed in one important area: delivering the best-in-class image quality. Wi-Fi is still a faff to use, there are fewer features than its Lumix TZ40 competitor, but if image quality is the number one priority then you needn't look further than this PowerShot. 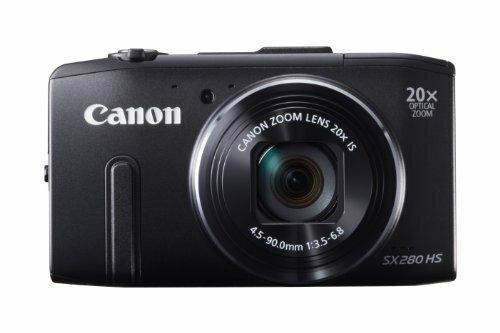 In the search for all-in-one compact camera perfection the Canon's thrown its latest tech into the ring: the PowerShot SX280 HS is the first Canon model to introduce the Digic 6 processing engine. But by resting on the same 20x optical zoom and 12.1-megapixel sensor specifications as its SX260 predecessor, is there enough to shout about in this latest travel zoom? Wi-Fi seems to be camera manufacturers' current focus to get people sharing their pictures directly from camera and that is the big new feature as found in the SX280. Otherwise it's deja vu - the SX280 has the same metal body, 25-500mm f/3.5-6.8 equivalent zoom lens and design as the SX260 before it. But you know what? Looking for what's new, rather than focusing on what's good, isn't necessarily the way to approach what the SX280 is all about. Its core specs are enticing: the varied zoom lens comes paired with decent lens-based stabilisation, there are both auto and manual controls accessible via a rear control dial, and that 12.1-megapixel sensor has already proven itself in the previous model. Digic 6 also means more power. Its inclusion in the SX280 ups the burst shooting mode to a 14 frames per second maximum and now 1080p60 movie clips can also be captured. However, we would like to see the SX280's 3-inch 460k-dot LCD screen boosted into a higher resolution touchscreen, similar to that of, say, the Panasonic Lumix TZ40, but otherwise the SX280 is a well-featured compact for the most part. There may well be slimmer cameras out there, but we find the SX280's design sits well in the hand and is comfortable to use. The body is metal, although its smooth finish looks more like shiny plastic and the gaps between panels don't make it look like the most thought-out of finishes. In use the rear d-pad can be used to access specific options such as exposure compensation from its four directional buttons and doubles up as a rotational pad to cycle through options. A press of the Func Set button to the d-pad's centre opens up an on-screen menu to access the majority of options and is easy to use and understand. But there's something missing from this menu: autofocus type, whichyou'll need to find in the main menu. This is a sticking point for the SX280 which, just like its predecessor, rests on centre-only, face-detection or tracking options when shooting in manual modes. That feels a little too restrictive, even if two focus-area sizes are available. There's no way to move the focus point around the screen either, and it's only in auto where a multi-point auto-select autofocus option takes over. Autofocus is fast enough, but it's not moved on since the SX260 model and, therefore, it's not as up to scratch as something like the Panasonic Lumix TZ40. The latter model opens up far more control in the way its focus system can be used, including the touchscreen control which succeeds in keeping things practical without the complexity. Canon ought to take a leaf out of the Lumix book on this front as we were expecting a push forward in this latest SX-model - one that's not occurred. Other features include a 5cm-from-lens macro mode which works a treat at the 25mm wide-angle setting and built-in GPS (global positioning satellite) technology geo-tags shots with location information. Wi-Fi opens the door to sharing images direct from camera. Well, it opens a crack in the door at least. Canon's first-stage Wi-Fi implementation does work, but it's long-winded to work with. You'll need to download CameraWindow software, wire the camera to laptop and register with Canon Image Gateway for starters. From here it's possible to share via Canon Image Gateway to Facebook, Twitter and email - but, and just like most competitors with Wi-Fi, each of those options has to be specifically allotted to the chosen camera before they become functional. Once that faff is out of the way things get a little easier, but there are still the usual password barriers. In the playback gallery an upward click of the d-pad will load up Wi-Fi access points - now it's time to enter in the WEP password which, minus a touchscreen, is slow to do. You may have noticed that we say images are shared via Canon Image Gateway - send a tweet and it'll invite your followers to look at the image on Gateway, not directly in twitter. It's poorly implemented and not what users will want in our view. We found it far quicker to take the SD card out and pop it into a computer where there's more control. When Wi-Fi's not available it's possible to pair with a smartphone for a paired connection on the go. This is where we see there being some occasional use, but you'll need to download the necessary app for it to work and in general the we don't see this Wi-Fi setup as being practical. It also drains the battery at a rapid pace. Image processing is the main area where the SX280 differs from its SX260 predecessor. Canon's been canny here: it's taken what many may see as a conservative 12.1-megapixel resolution - just about the ideal resolution as far as we're concerned - and beefed it up with a more intricate engine. There's no play in adding unnecessary additional pixels of resolution. To the eye results aren't drastically different from to its earlier Digic 5 counterpart, but that's not to take away from what are exceptional images all things considered. Indeed we're yet to see a 20x optical zoom competitor with 1/2.3-inch sensor size that can better this Powershot, and that's what will really sell the SX280. The ISO 80-6400 range is also broader than that of its predecessor. Not only is there a lower-sensitivity ISO 80 option, there's also now ISO 6400 at the top end which adds an extra stop to high-sensitivity shooting. In auto ISO it's not possible to push beyond the ISO 1600 sensitivity, however, as the camera won't auto-select its two highest sensitivities without manual intervention. This can be a bit of a pain when it opts for a slow shutter speed and increases the likelihood of image blur when an additional bump in ISO would be preferable. But it does makes sense to some degree as, despite results being top class, the SX280's highest ISO settings are somewhat soft and present mottled patches where the processing engine has done its best to hide image noise. Dip down to ISO 1600 and while there's definitely softness via processing, we've seen lesser cameras with same-size sensors look worse off at lower sensitivities. At the bottom-level ISO 80 sensitivity detail is far more prevalent, and even if there is a whisper of grain-like noise within detail areas - often the greyer mid-level tones - it does little to affect overall quality. Looks top notch to us. There is another slight imperfection worthy of mention too: as the zoom extends there's increased likelihood of fringing, those overlapping blue/purple shadows that can appear to a subject's edges. In the case of the SX280 they're subtle as the processing engine spots them and dials out much of the unwanted colour. The SX280 HS doesn't add much compared to its year-old SX260 sibling. We would rather have seen the addition of a touchscreen LCD and broader, more accessible autofocus options added on instead of the Wi-Fi feature which, in its current state, is just a bit of a faff to use. It will come in for occasional use though, so better to have it than not. But that's not to say this camera hasn't got he good stuff where it matters: image quality is the best in class throughout the ISO sensitivity range, while that 20x optical zoom delivers detailed images that are extra steady in preview thanks to the lens-based stabilisation. The Digic 6 processor coupled with the 12.1-megapixel sensor seems like the perfect match. But the SX280 could do with just that bit more pep. Where features are concerned the likes of the speedier Panasonic Lumix TZ40 puts this PowerShot on the back foot, even if the Lumix doesn't win when it comes to image quality. That's what it boils down to really: if image quality is your number one priority then, within this compact camera category, you needn't look further than this PowerShot which stands out above and beyond its higher-resolution competitors. We welcome Digic 6 with open arms.